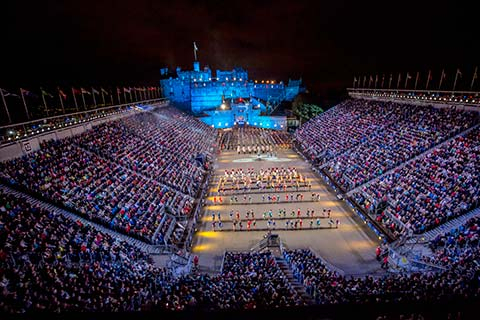 The Tattoo is a global gathering that brings together performers from 48 different countries and visitors from all over the world, taking place at the Edinburgh Castle Esplanade. The event is televised each year and provides a platform for military performers and musicians alike to show off their talent to the world. The Tattoo takes place on Edinburgh Castle Esplanade, as it does every year, and the castle turns into a backdrop for performers from across the globe. You wouldn’t think that it was Edinburgh Castle upon first view as it transforms into an incredible arena to showcase the world’s military talent. The easiest way to get to the Tattoo is to walk or get a bus or taxi to the Royal Mile and walk to Edinburgh Castle from there. If you already have your tickets then you can head straight to the venue. The top of the Royal Mile as you approach the castle is closed off to traffic during the August festivals to help the flow of the many people on the streets. If you need to pick up your tickets and merchandise then visit the Tattoo Office at 1-3 Cockburn Street and from there, head along North Bank Street, onto Bank Street and then up the Royal Mile to the castle. Ticket prices vary from £25 to £480, although the average price is around £80. Tickets can be purchased online at Etickets or by calling 0131 225 1188 and collecting them. The theme for this year’s Tattoo is The Sky’s The Limit - in celebration of the Royal Air Force celebrating its 100th birthday. The festival will also embrace the Year of Young People 2018 with young, energetic, military performers doing their thing on the Castle Esplanade. A local tip if anyone is looking for cheap tickets there is a preview show on the 2nd of August which you can get half price tickets for, these go on sale on 23rd July and can be bought on the Edinburgh Military Tattoo Website or by calling the booking office. Having always lived in Edinburgh i can't believe I've never been! There's nothing quite like it and i'm sure it's on everyone's bucket lists. Having worked at places near the castle i would definitely say to pick up your tickets from the tattoo office earlier in the day if possible, there is normally a rush of people nearing the start of the performance stressing to find the office so you can get caught up in a lot of crowds. I'm coming back home for the Tattoo in Aug and booked accommodation last year to be sure to get a place to stay. What I didnt notice when I was booking is that the accommodation doesnt have parking. Is there anywhere around Morrison St where I can securely park my car for 24 hours without it costing me an arm and a leg?